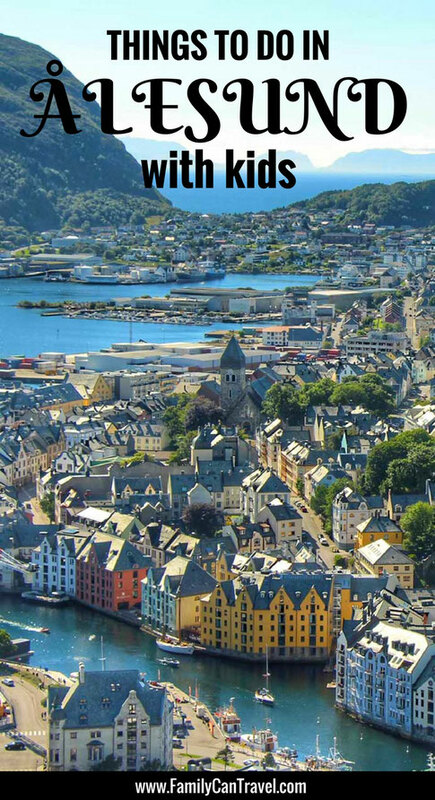 Alesund was the inspiration for our trip to Norway. We had just returned from a month in Italy and were catching up on some TV shows we had missed while we were away. 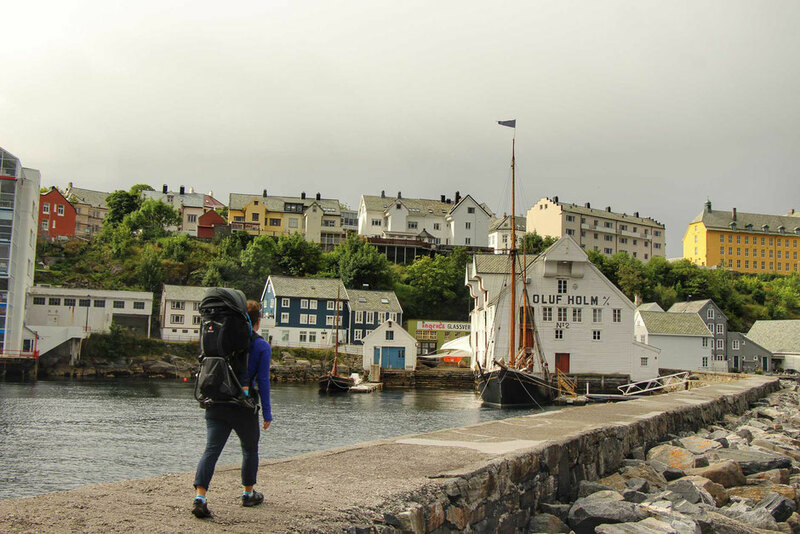 Still fans of the Amazing Race, we were blown away by the images they showed of Alesund. 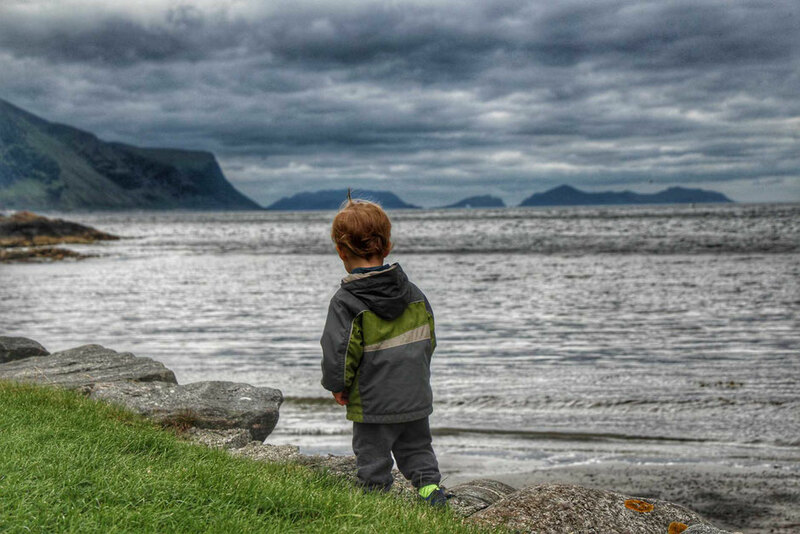 We started looking into a trip to Norway with kids and it wasn’t long before we were hoping on a plane to visit Alesund (with a toddler and preschooler) just a couple of months later. We took the short 40 minute flight from Bergen to Ålesund on SAS. 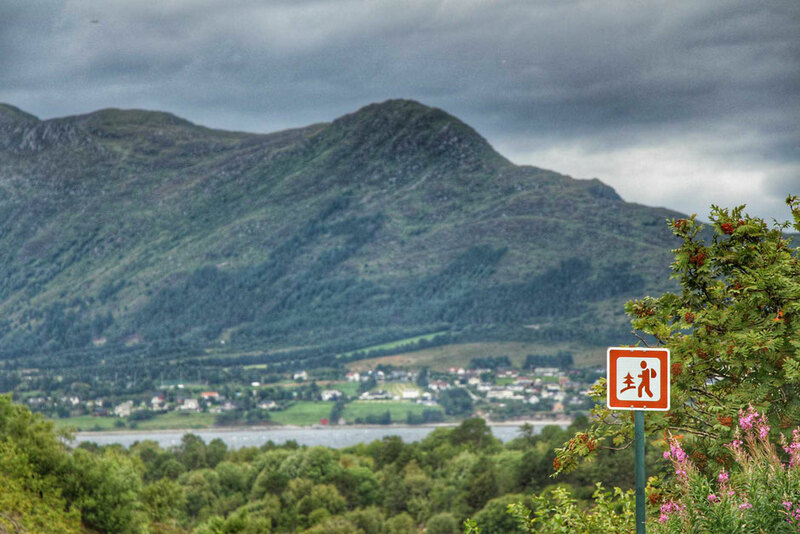 Once in Ålesund, we rented a car to do a road trip to Molde, the Atlantic Road and Trollstigen. We did have to return our rental car to the airport when we got back to Ålesund, so we had a chance to try out the Airport bus service. It will get you to the city center in approximately 25 minutes. See the Flybuss Schedule here. 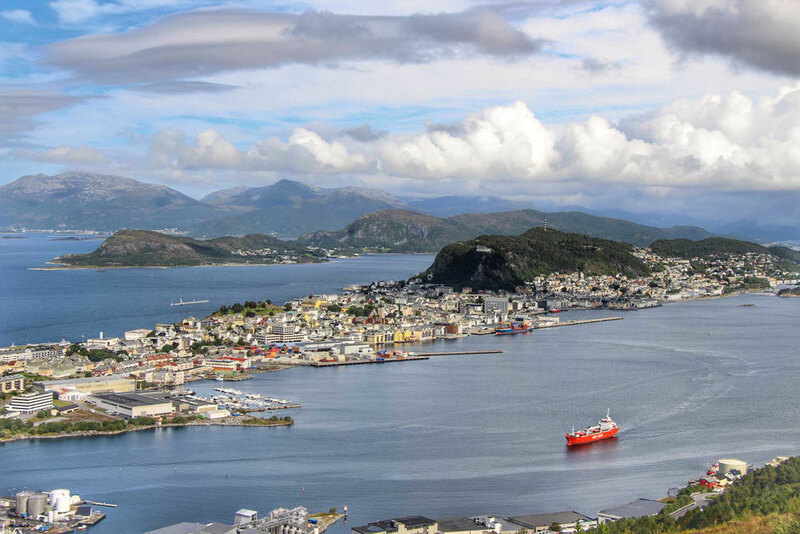 One other option to see Ålesund is by cruise ship or doing a port-to-port voyage on the Hurtigruten. 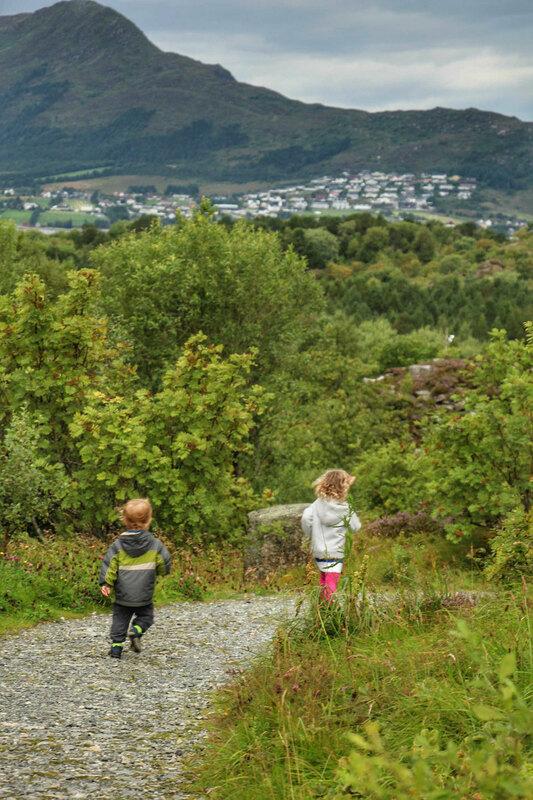 Don’t miss our 5 day Oslo itinerary with kids and best things to do in Bergen with kids. Our Airbnb apartment was a ways out of the main part of town, so we took the city bus often. It was quick and convenient. Walking was the easiest way to get around once we were in town but to get to some of the farther out locations, the bus was definitely the way to go! 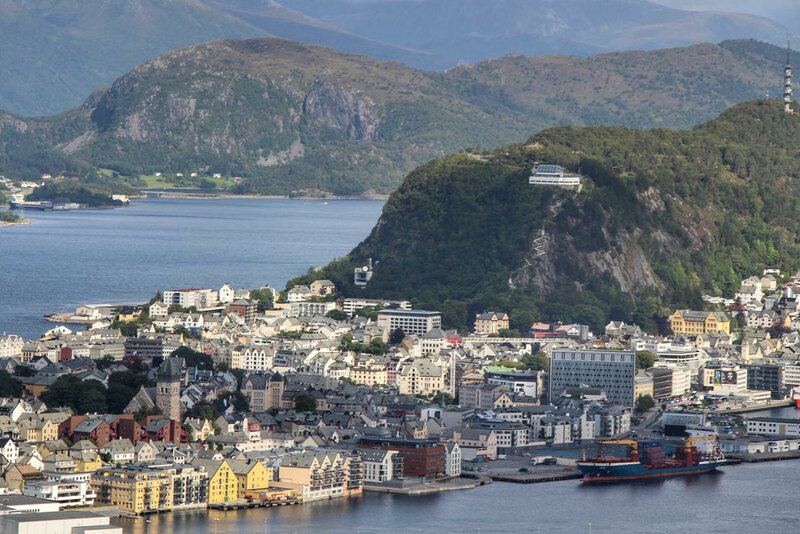 Another option to see the sights around Ålesund is the Hop on Hop off Bus, which can be caught right at the cruise terminal. 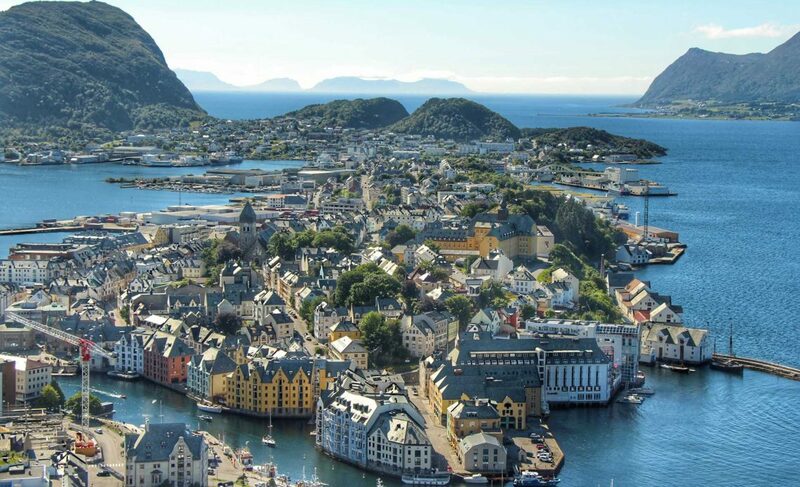 This panoramic view of Ålesund and the surrounding islands is spectacular and not to be missed. There is also a café up at the top where you can relax to enjoy the view. You can get to this viewpoint by walking up the 418 steps from the Town Park or by taking the City Train up to Fjellstua. 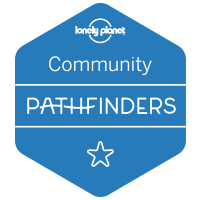 We used our favorite hiking app to find a hiking trail that started directly behind our Airbnb apartment and took us along paths in the trees up to the viewpoint. From the top we came back down the stairs to the Town Park. Tip: There’s a great playground in the Town Park. It’s a large playground with an area for smaller kids. It also has a big pirate ship, swings, a sandpit and a rotating climbing net. In 1904 a fire destroyed Ålesund’s entire city center and 850 homes were burnt to the ground. With both local and international help, the city was rebuilt with the Art Nouveau architecture you see there today. Now filled with shops and restaurants throughout, this is a fun place to explore. 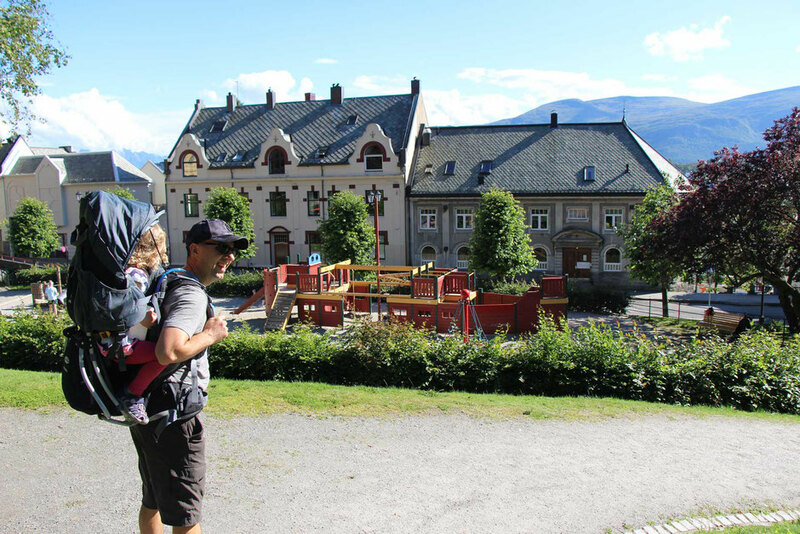 With two small kids, it was also nice to let them wander through this charming part of town. After walking through the many little alleyways and along the water, we slowly meandered to the north side of the island to walk out on a jetty with a small lighthouse. There were some nice views here but it was incredibly windy so we didn’t stay long. 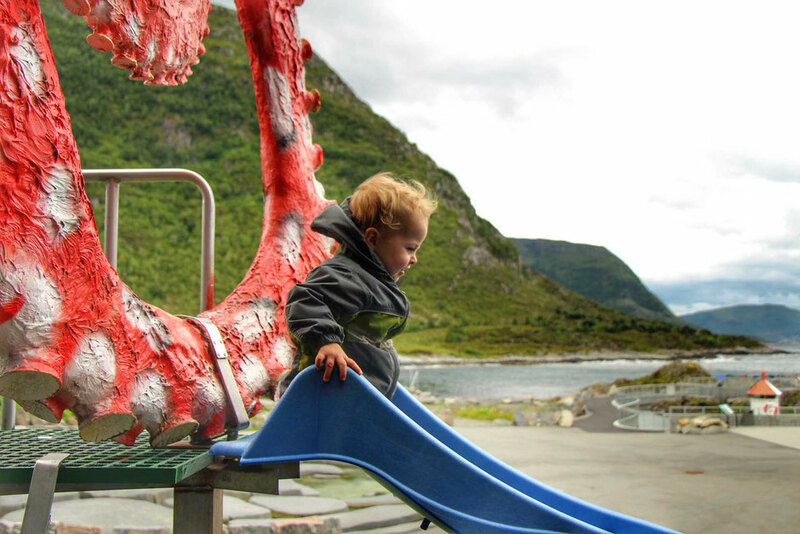 Tueneset Naturlekeplass is a beautiful oceanfront wilderness area near the aquarium. It was a great spot to let the kids run around and explore nature. They climbed rocks, picked wild raspberries, ran on thegrass, etc. There are a few short trails in this park as well. We took one to an oceanfront viewpoint. Always ones to try beat the crowds, we arrived at the Alesund Aquarium right at 10am. Getting to places like this when they open is always a great idea with small kids. It felt like we had the entire place to ourselves. 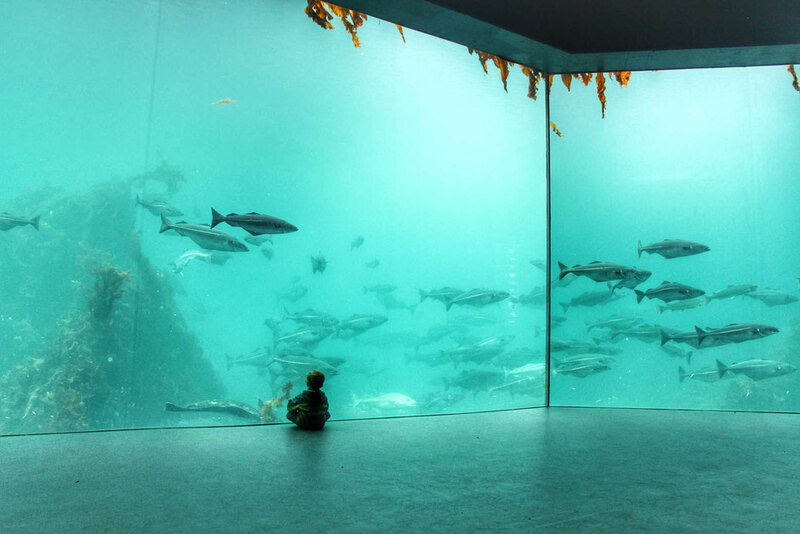 This aquarium does a great job at showcasing the sea life along the Norwegian coast and the Atlantic Ocean. It has a unique setting being built right into the coastline, which offers up some magnificent views of the Atlantic Ocean from the outdoor facilities. The highlight of the aquarium for us was the Atlantic Ocean room, which had a massive, floor-to-ceiling tank, with three panes of glass. The tank filled the entire room. 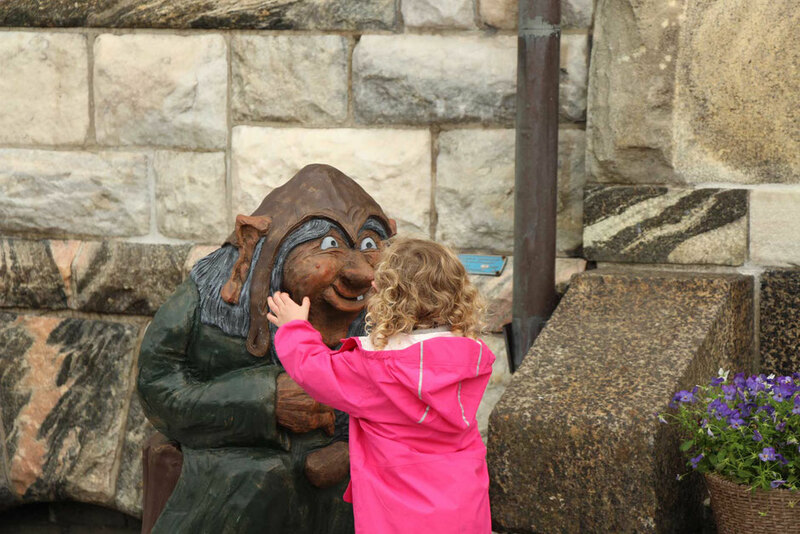 It was so large, they provided a seating area for people to stop and enjoy watching for a while – and we had it all to ourselves! Tip: At 1pm the divers get into the tank to hand feed the fish! 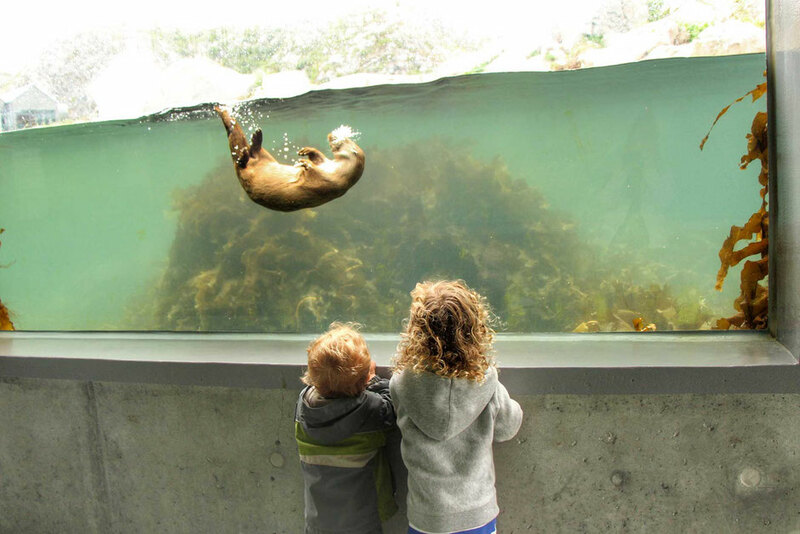 The outdoor area is also not to be missed, with the Penguin Park, Otter Island and Seal Bay. The underwater observatory makes this a really fun area to walk around for the kids. 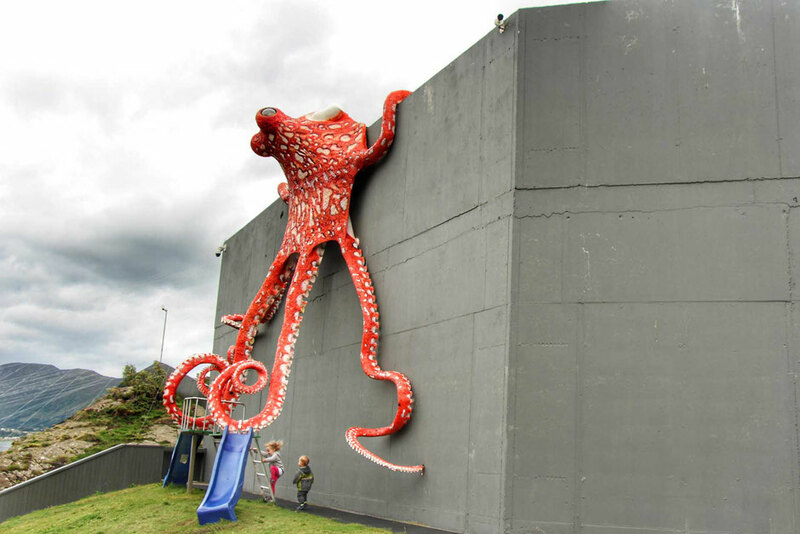 On a nicer day, we could have spent hours here as they have a play area with a giant Octopus sculpture, a water park and sand area for the kids to play in. We really wanted to do some hiking in Ålesund given the surrounding natural beauty, but on our last day we awoke to heavy rain. Rather than try to find an indoor activity, we waited it out. 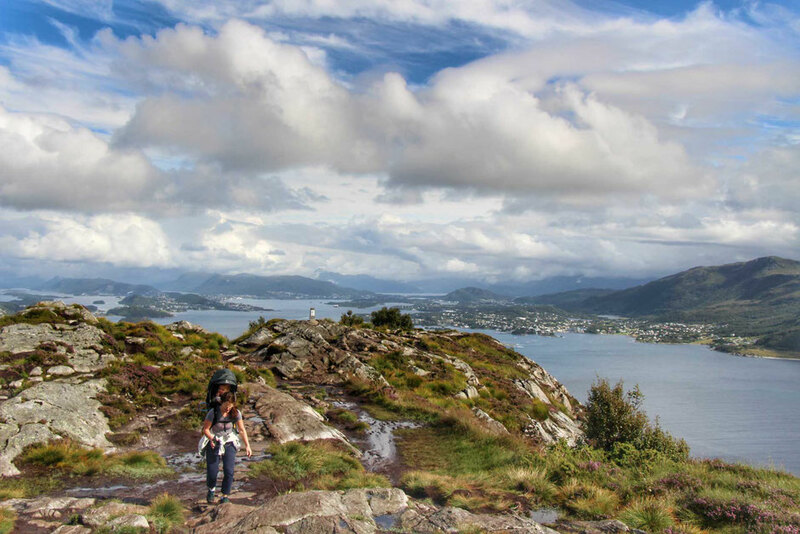 Thankfully our patience was rewarded and by early afternoon we were on a bus to Hessa Island, home of Sukkertoppen (or Sugar Loaf Top) which is the most popular mountain hike in Ålesund. How did we know where to hike? 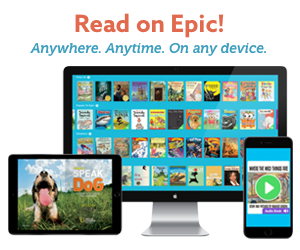 We use this app every time! With the heavy rain in the morning, the trail was quite muddy and slippery, making the 6km round trip longer than we had anticipated. 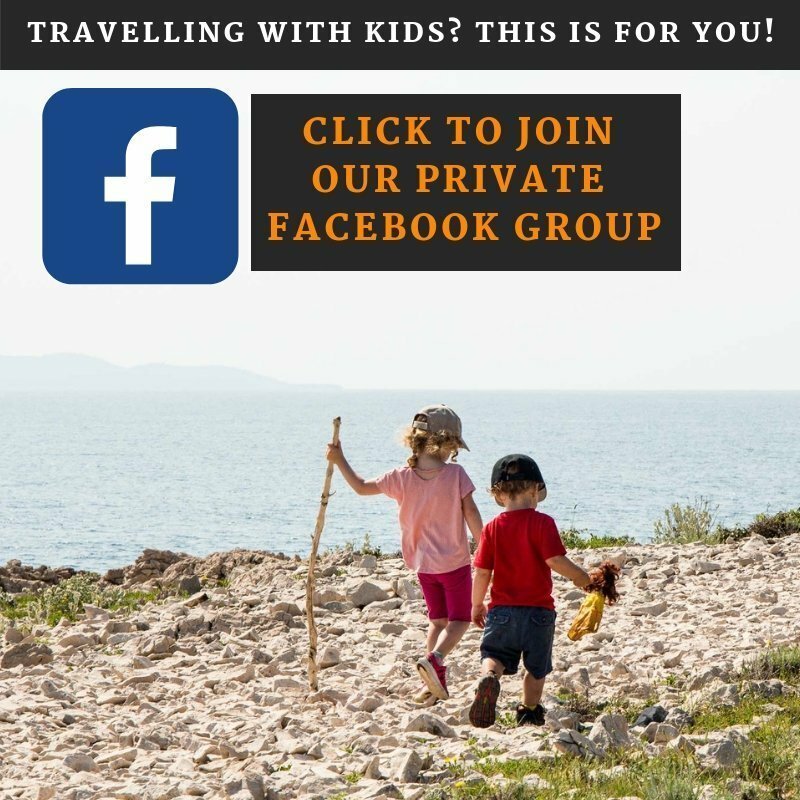 It was difficult at times carrying kids on our backs while traversing the rocks and watching out for tree roots bound to trip us up, but we had become pretty adept at hiking with kids on our backs and felt comfortable doing it. Once out of the trees, the views on the way up and at the top were worth every effort! 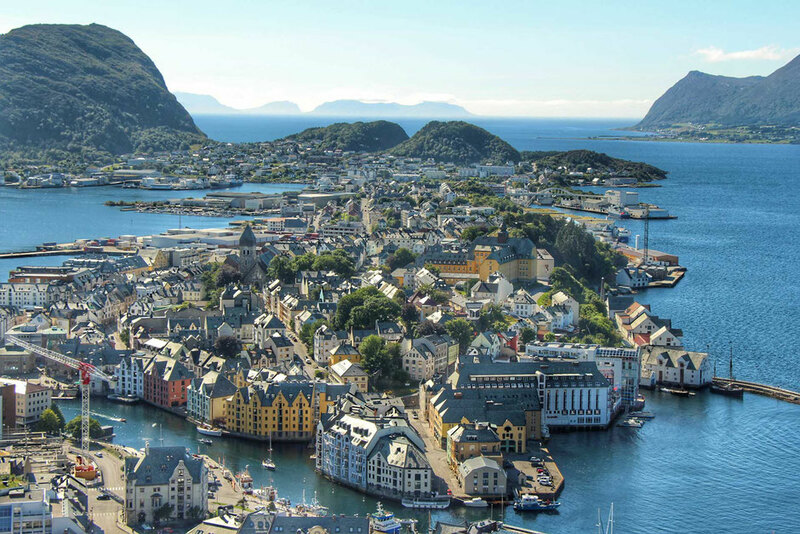 You can see Ålesund and virtually all of the surrounding islands along with the inlets to some fjords. 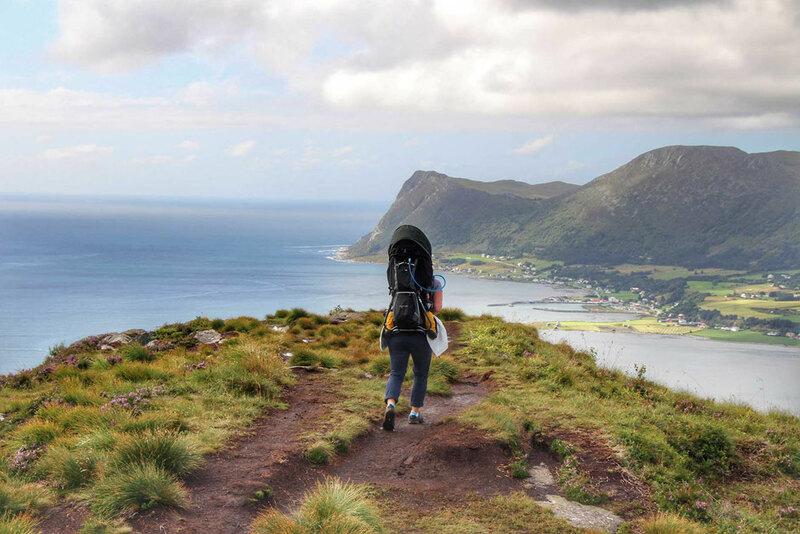 At 300m above sea level, there is enough elevation to get great views in all directions. Not really anticipating how the mud and slippery rocks would make the decent even more difficult, we had to be extra careful, which made this portion take longer than it typically would. 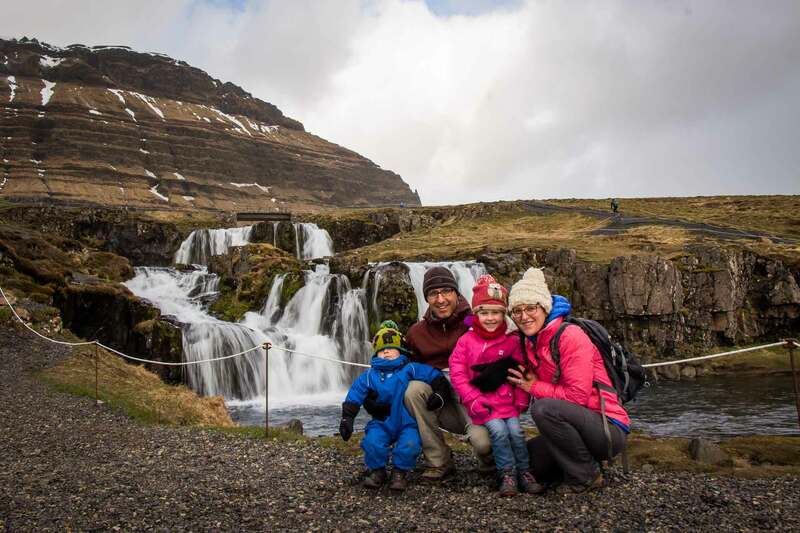 We highly recommend this hike, but if you are carrying a baby or toddler ensure you are comfortable doing so in these conditions. 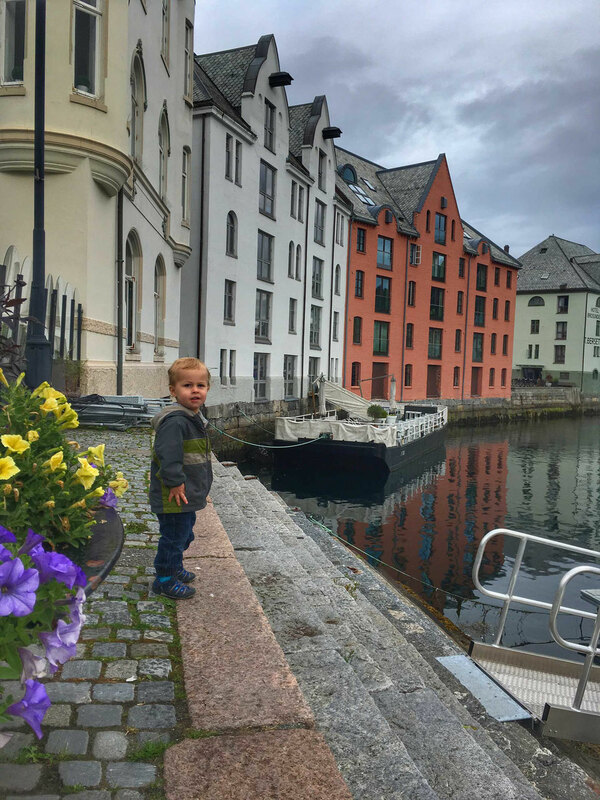 Ålesund was our jumping off point to take the Hurtigruten to see the famous Geirangerfjord and a road trip to the Atlantic Road, Molde & Trollstigen. 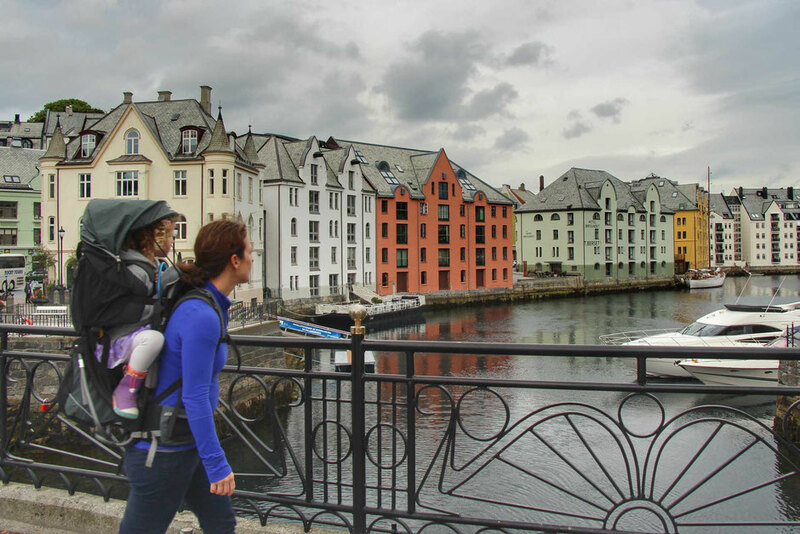 Have you been to Ålesund with kids? What was your favourite part? Tell us in the comments below.